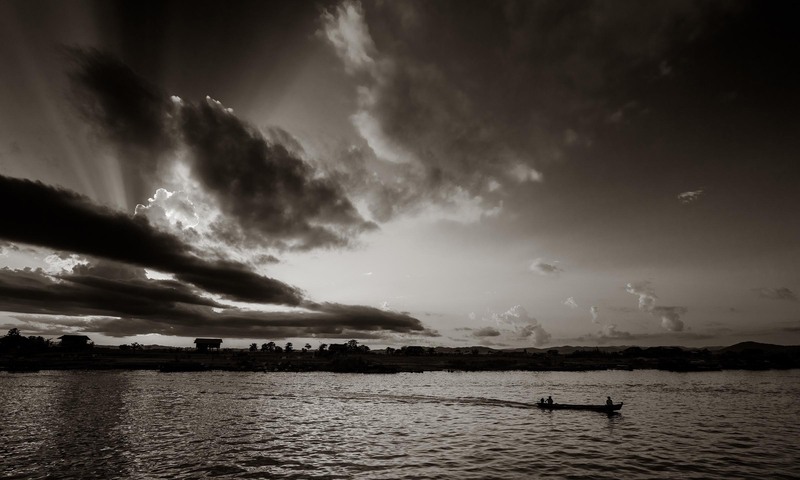 Dramatic skies over the Irrawaddy River in northern Myanmar near the city of Bhamo. These days it is rare that I have the opportunity to take a couple of weeks and do a documentary travel type story. 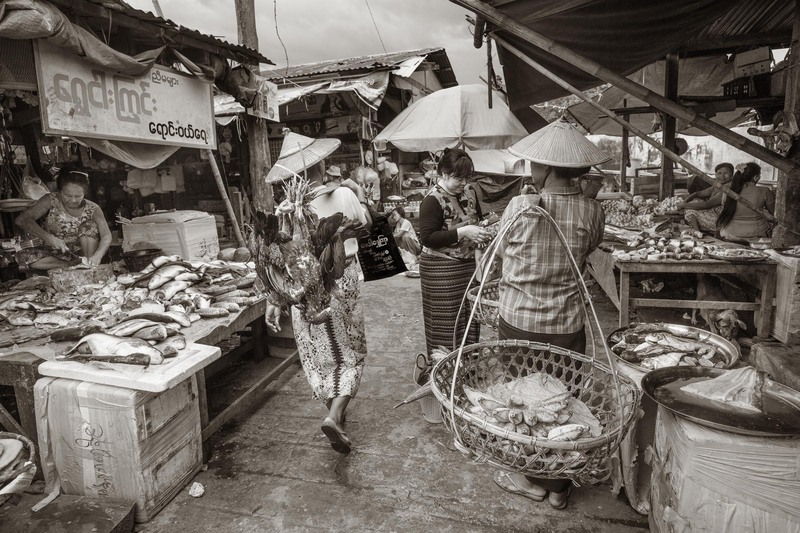 However, when my long time friend and writer Paul Ehrlich called and said that he wanted to do a story wandering up and down the Irrawaddy River in Myanmar, a country I have long wanted to visit, I found a way to clear the time I needed to make the trip. 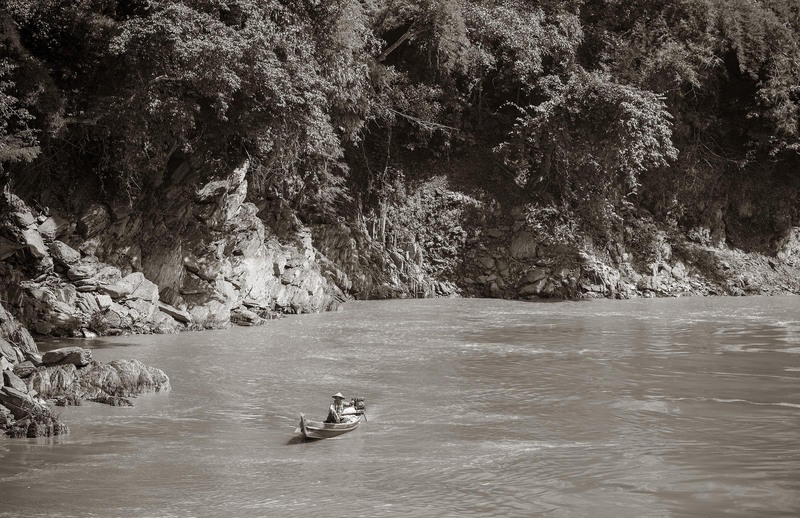 The journey had to be done at a specific time when the water level at the northern reaches of the river was high enough to allow large boat to navigate without getting stuck in the muddy river bottom. 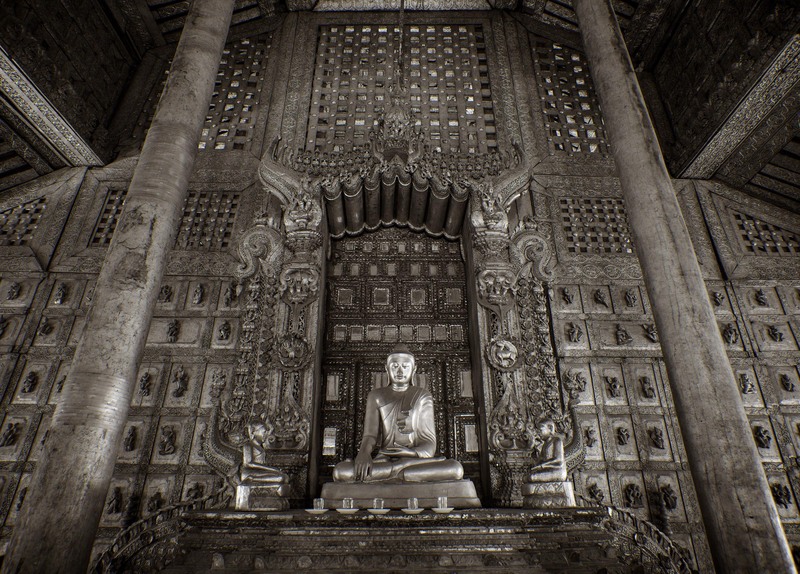 Our journey would begin in Mandalay where we would board the boat that would take us up to northern city of Bhamo, located very close to the border with China, and turn around and bring us all the way down to the ancient city of Bagon. The entire trip was set to take 11 days. 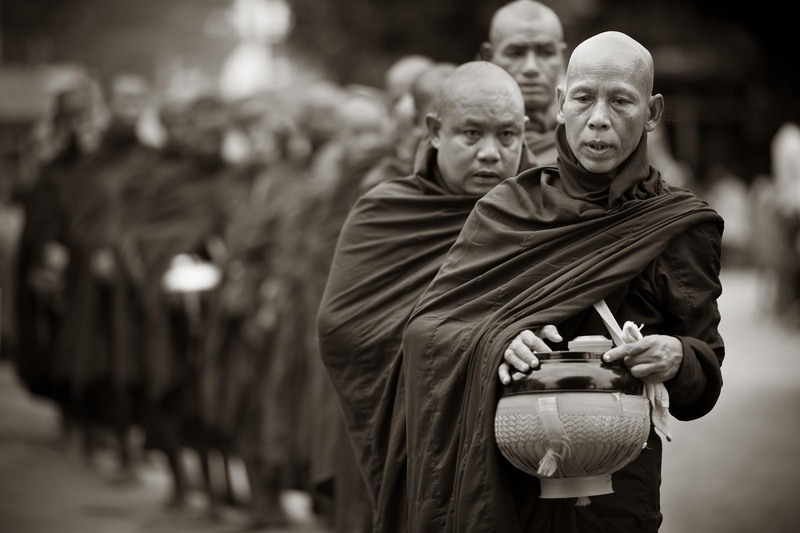 Buddhist monks out to gather alms in the early morning hours in Mandalay. 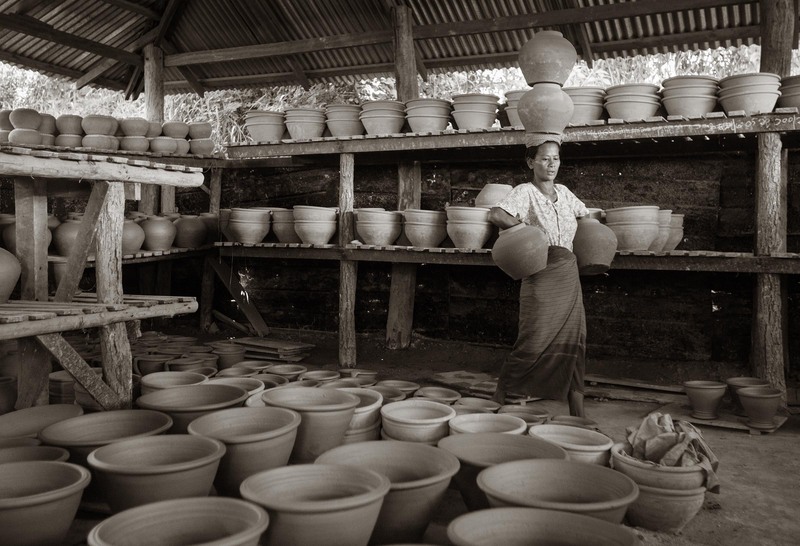 In the village of Nwe Nyein, known for its many pottery kilns. 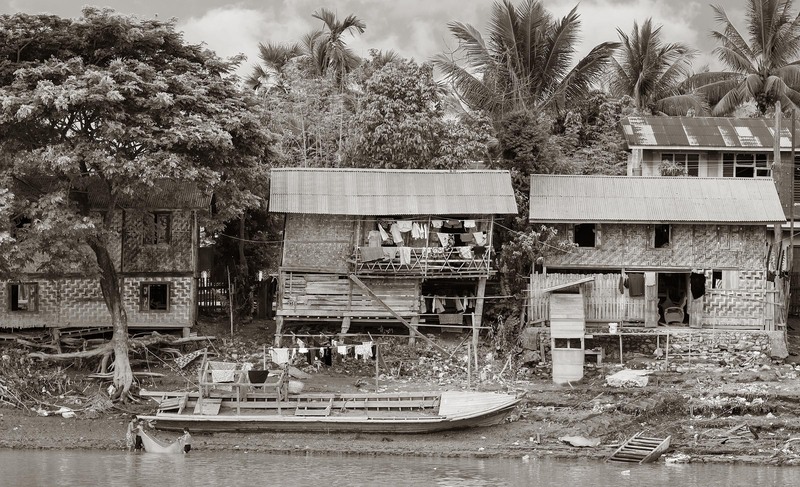 As we cruised up the river one of our early stops was at the village of Nwe Nyein. 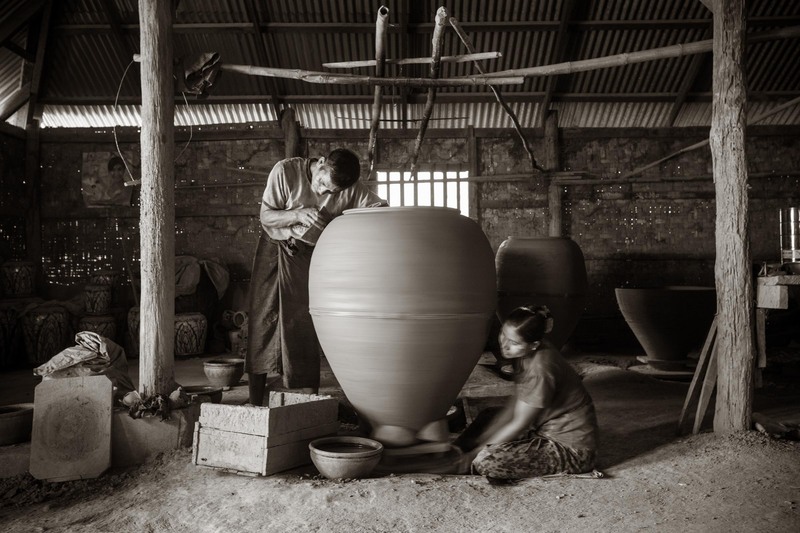 The entire village was dedicated to one industry and that was to produce pottery. The amazing thing was that it was all done without the use of electricity. Each wheel required two people. One to turn the wheel and the other to shape the pot. Some were turned by hand while others employed their feet. Truly a low carbon footprint operation…at least until they fire up the kiln. 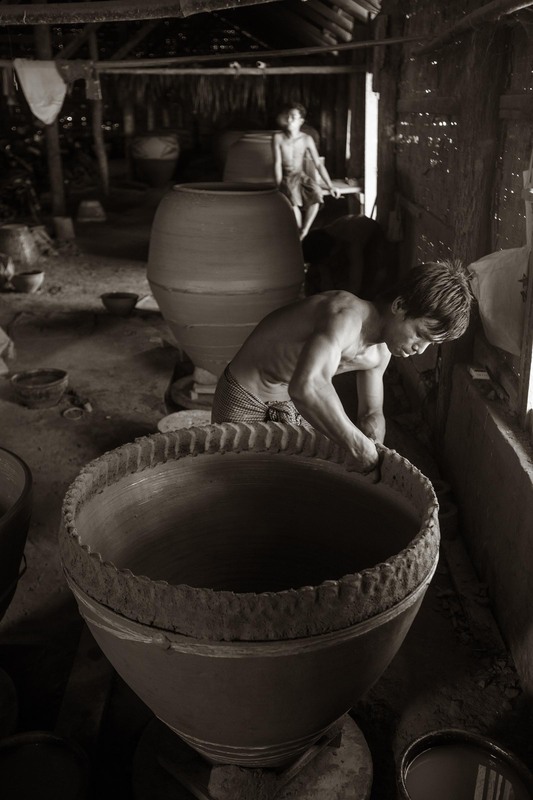 Pottery is made using only human power to turn the pottery wheels in the village of Nwe Nyein, known for its many pottery kilns. 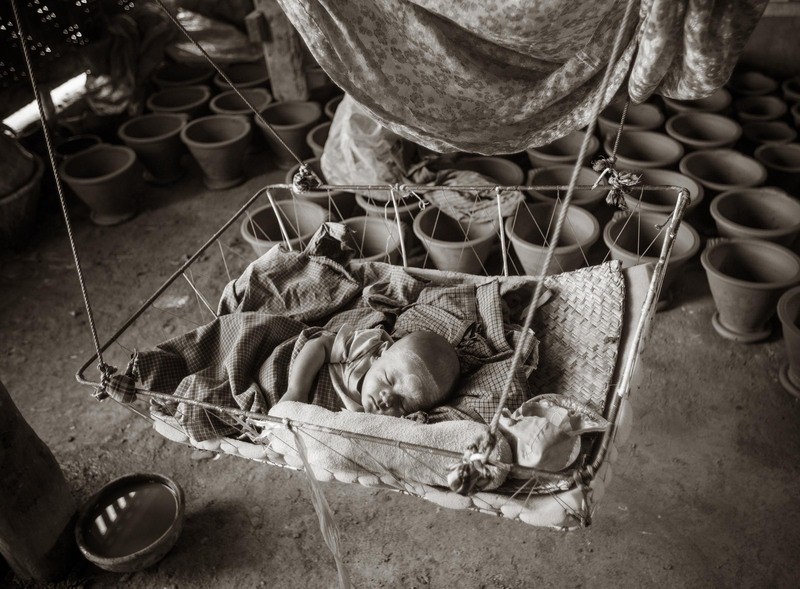 While the parents work an infant naps during the afternoon in the village of Nwe Nyein, known for its many pottery kilns. Further up the Irrawaddy we stopped in at the island of Shwe Po. At this point the river is quite wide and can only be crossed by boat. 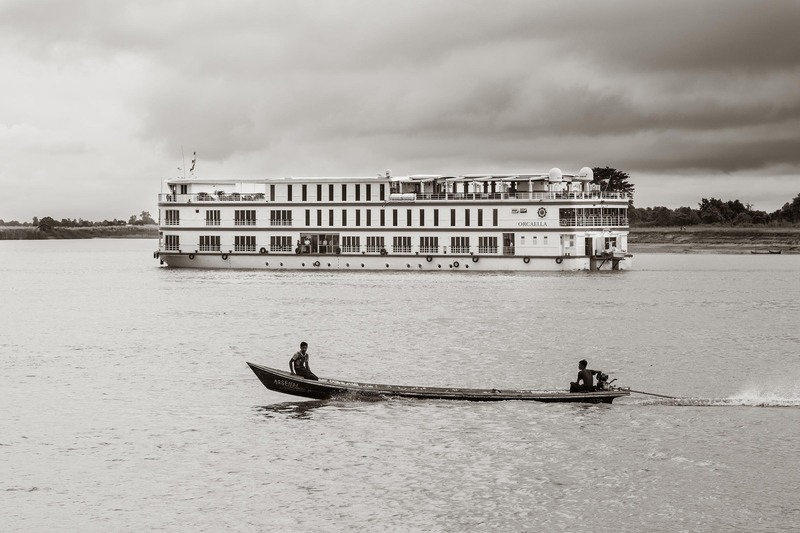 River boat taxis are especially busy in the mornings and evenings when students need to cross to reach their schools. The island does have an elementary school but the older kids have a bit more of a commute. 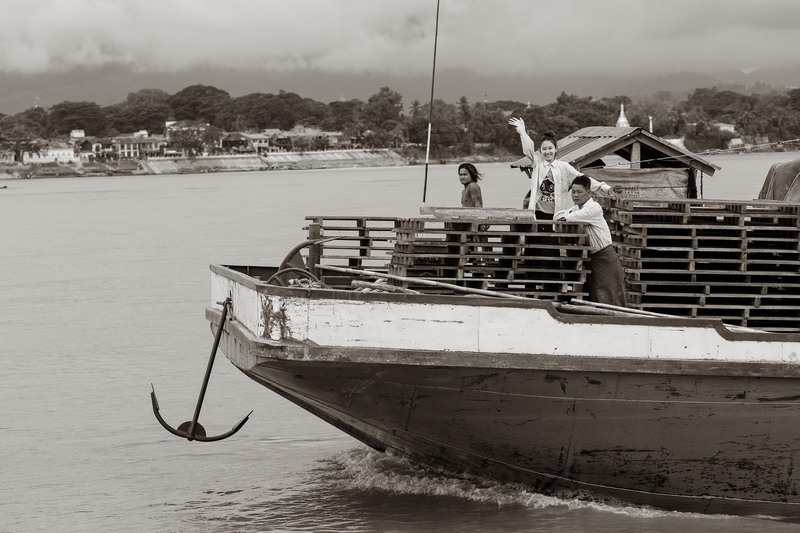 Students on their way to school are ferried across the Irrawaddy River from Shwe Paw Island. 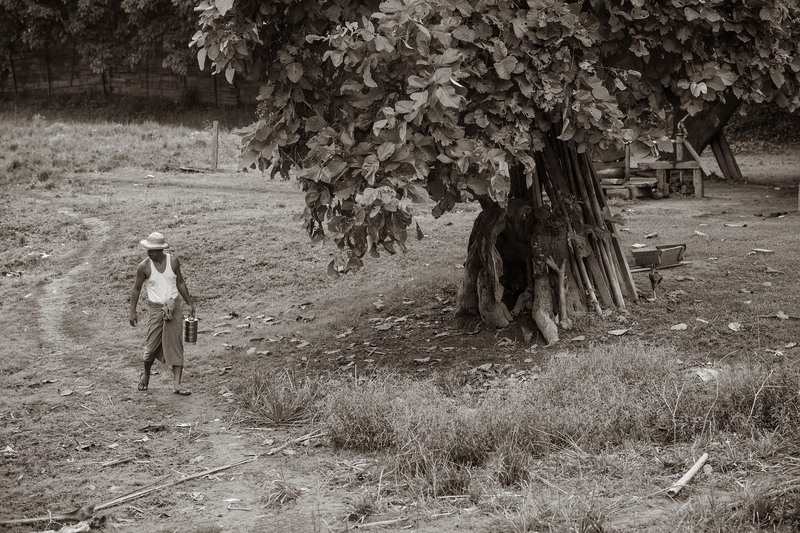 Students on their way to school on Shwe Paw Island. 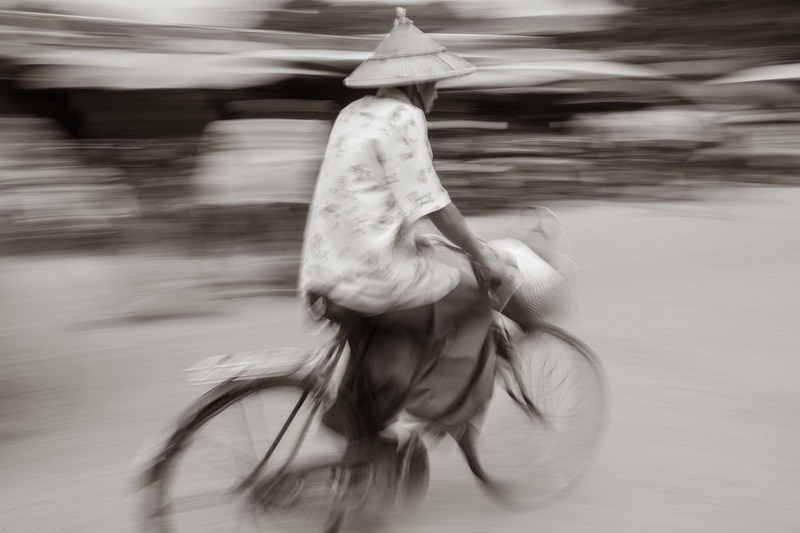 A resident on Shwe Paw Island walks to work. 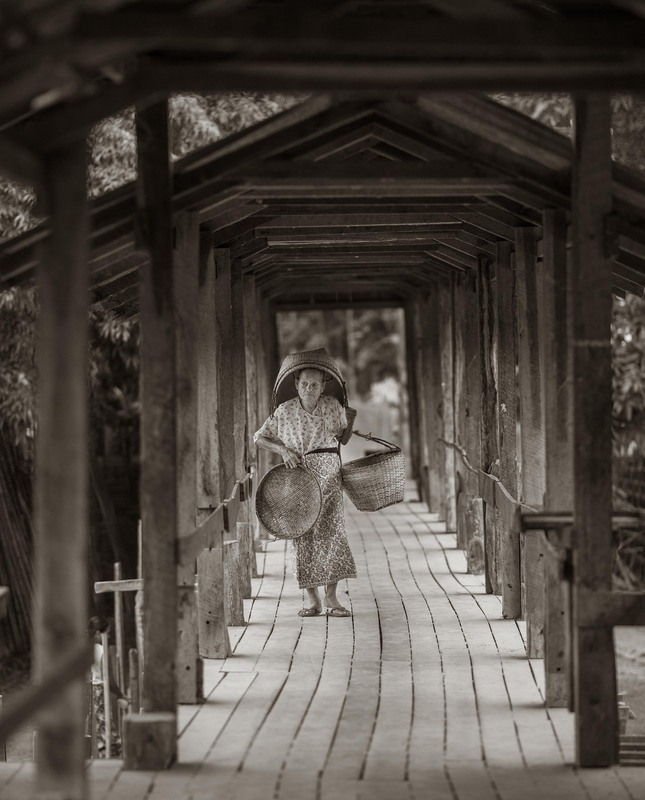 Crossing an old wooden bridge on Shwe Paw Island. Life on the island is quiet and laid back. 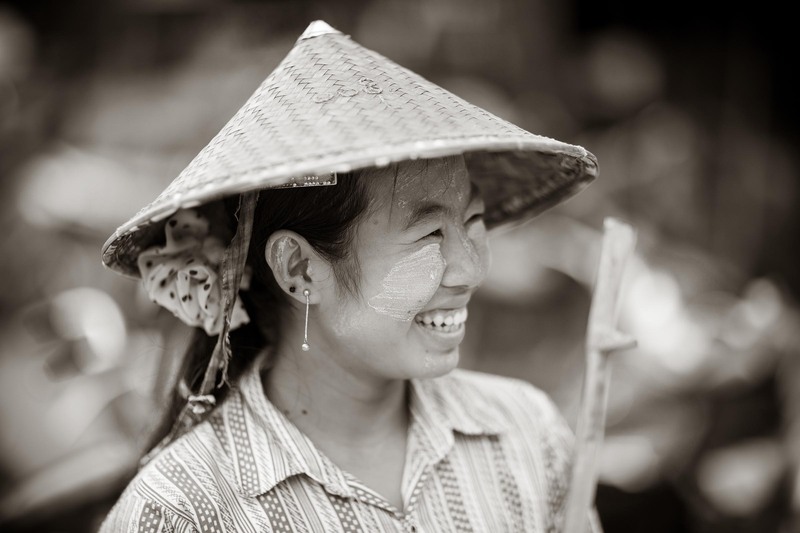 Most people here earn their living from either farming or fishing or perhaps both. 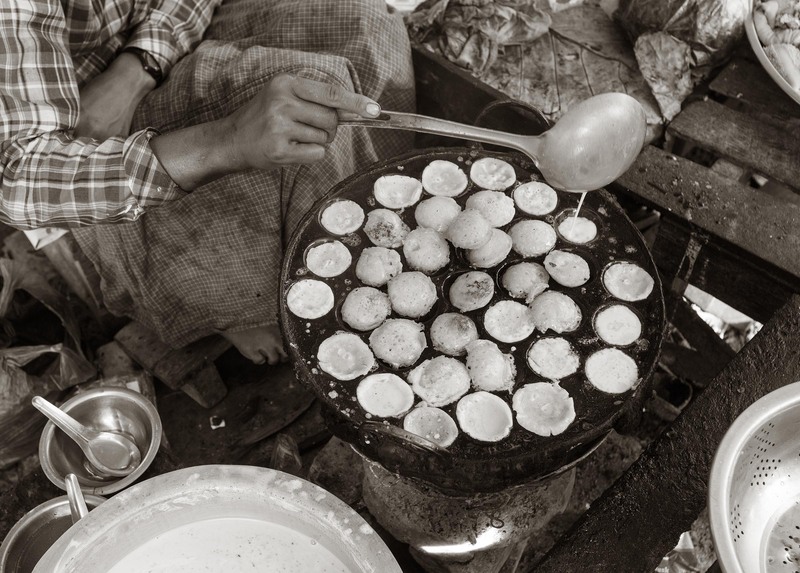 Daily life along the banks of the Irrawaddy River. Being on the boat removes you from the activity taking place on shore. The lack of human interaction makes one feel like the scenery is more akin to watching a continuous running film. Daily life is out in full view for all to see. From catching fish for that evening’s supper to washing up after a long day of work. 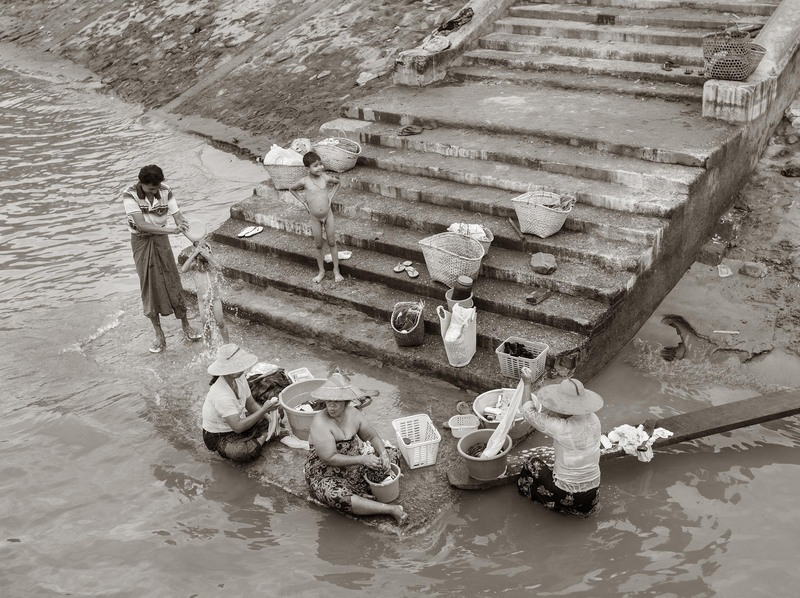 Daily life along the banks of the Irrawaddy River at the city of Katha. 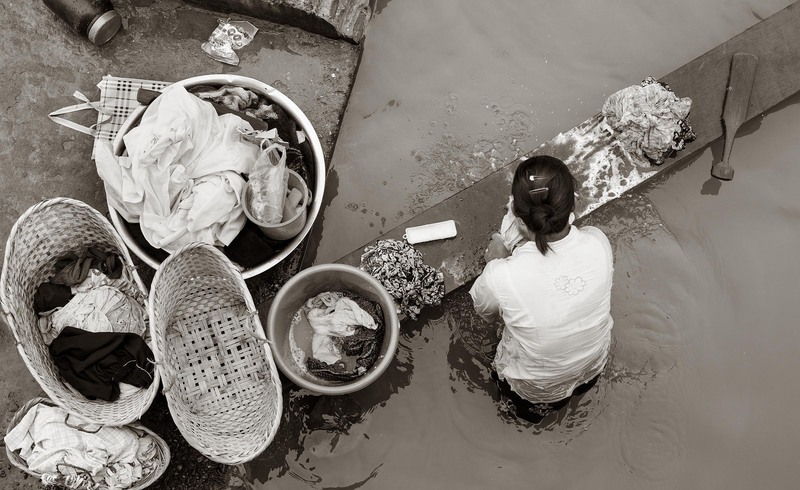 As the sets over the Irrawaddy River residents of the town of Katha come to the riverside to bath and wash clothes. All along the river are settlements both big and small. 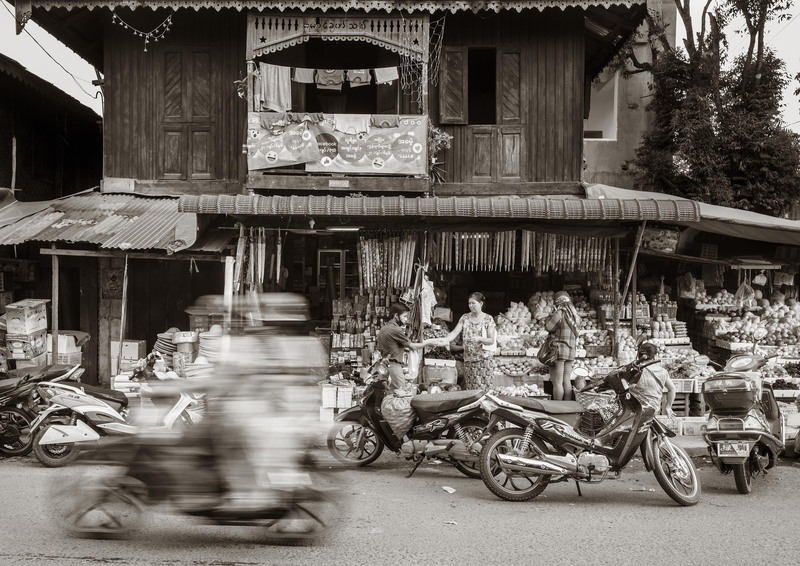 The cities of course are more chaotic than the little villages but each have their own charm and provide copious amounts of visual stimulation for a wandering camera. Though I’ve been to a million wet markets and outdoor shopping areas I still find fascination with these places in every country I visit. They are often similar in design and the sellers all have one mission, and that being to sell their products, but each has its own character and it’s fun to look for unusual ingredients, local snacks, or colorful characters to photograph. Or maybe its just have fun following a person around who is carrying load of chickens on their shoulder. 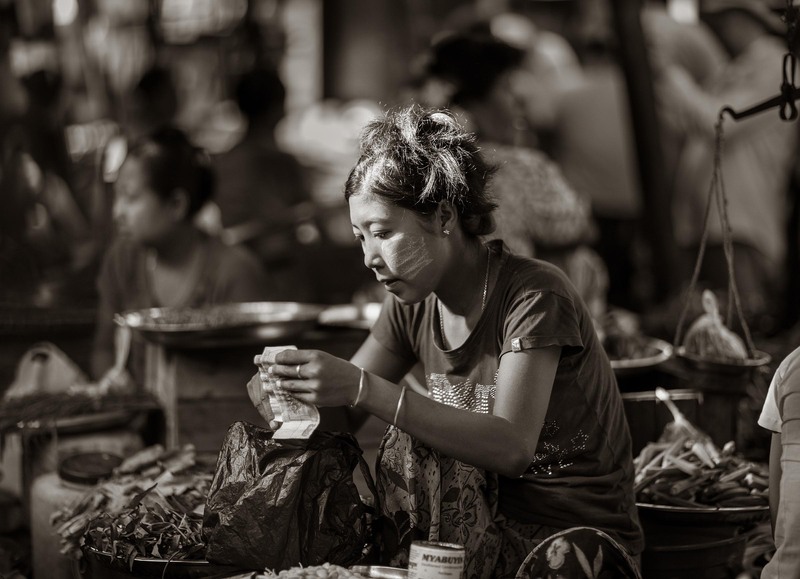 In a local market in the city of Katha. 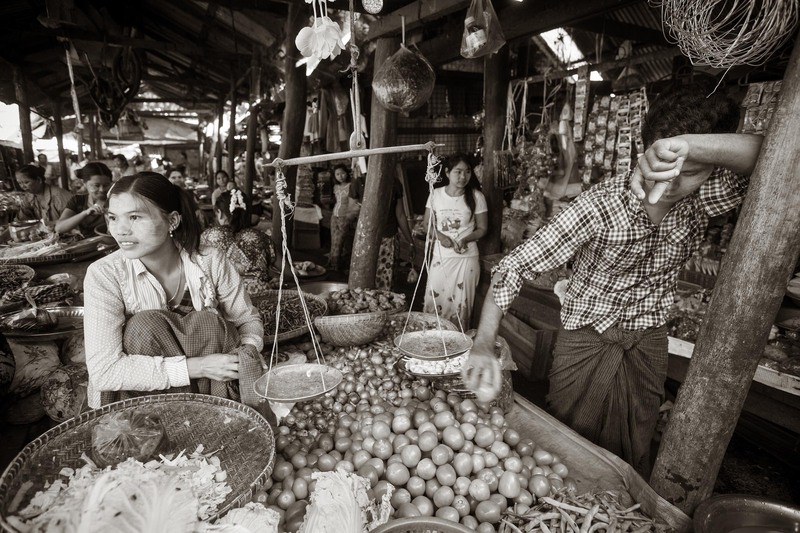 In a local market in the village of Kyan Hnyat located along the Irrawaddy River. 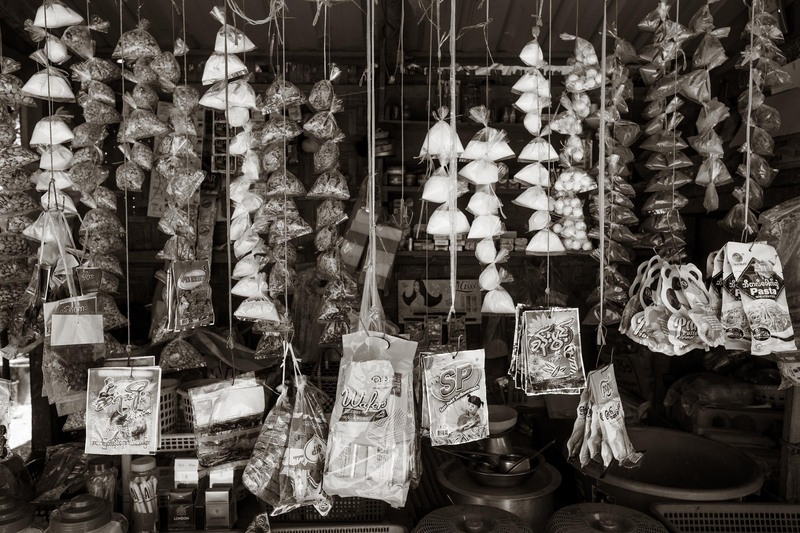 A variety of items for sale in a local convenience store In the village of Nwe Nyein, known for its many pottery kilns. Cruising along the street in the city of Katha. One of the wonderful things about being a photographer is how the camera is like a magic wand which opens doors and allows me into other peoples lives. There is, however, a fine line between being curious and intrusive. When entering another’s personal space one has to have all senses on full alert and be observant has to how you are being perceived. I will often seek a kind of permission from someone I’m photographing, either through a gesture or by directly asking them, but there are times when things are coming together and you don’t want to intervene and just photograph the moment. These kinds of situations come up constantly when shooting in public, or even private places. 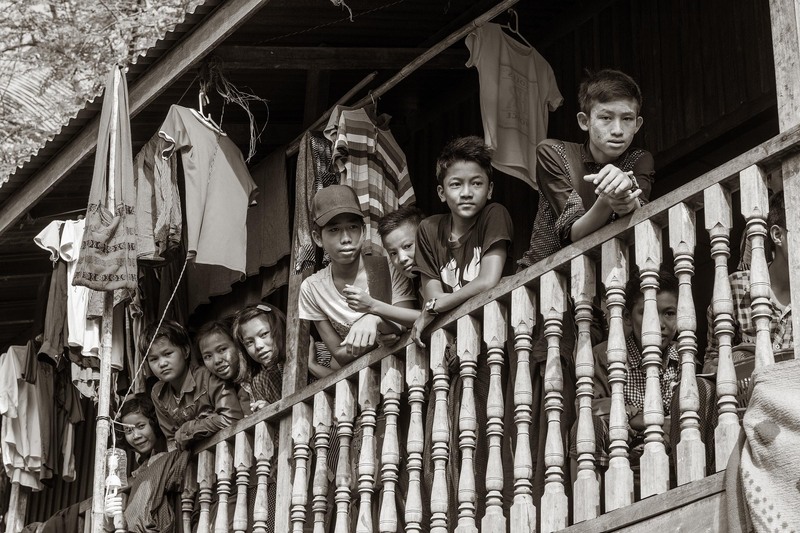 While in wandering through the village of Kyan Hnyat Paul and I looked up and saw a group of high school students peering down at us from a second floor building. It was clear to us that this was a local high school so we wandered into the courtyard. Students were everywhere studying. Either in the simple wood floored classroom or simply squatting in the courtyard reading their books. With virtually no verbal communication it was clear we were welcome. English was actually one of the subjects being taught that day so it seemed that our visit was a pleasant surprise for the students. At one point we even gave a little talk in front of the class. Paul and I were a poorly rehearsed comedy duo trying to get the kids to laugh as we were worked the room. Which they did. 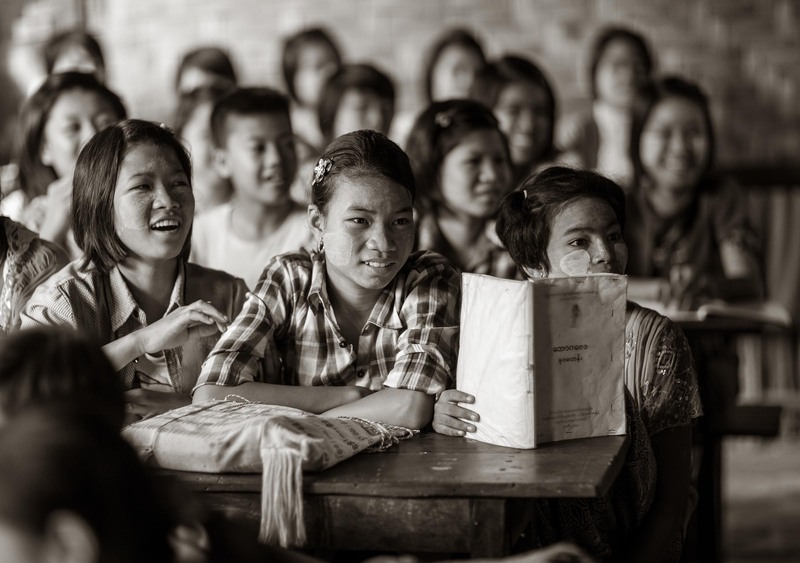 Students in a local school in the village of Kyan Hnyat. 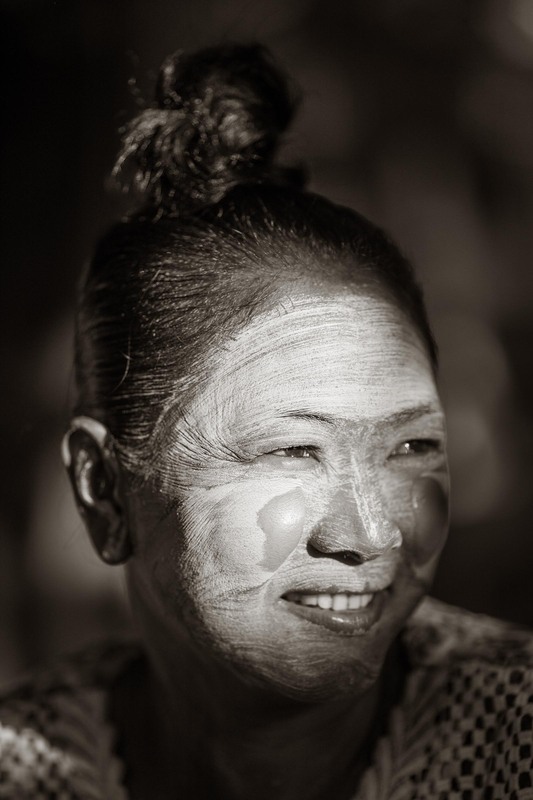 One of the first things travelers will observe upon entering Mayanmar is the yellowish white colored substance applied to the faces of mainly women and girls but can also be applied by men and boy. The substance is called Thanaka and is made by grinding the bark, wood or roots from tree on a flat stone mixed with water to form a paste. 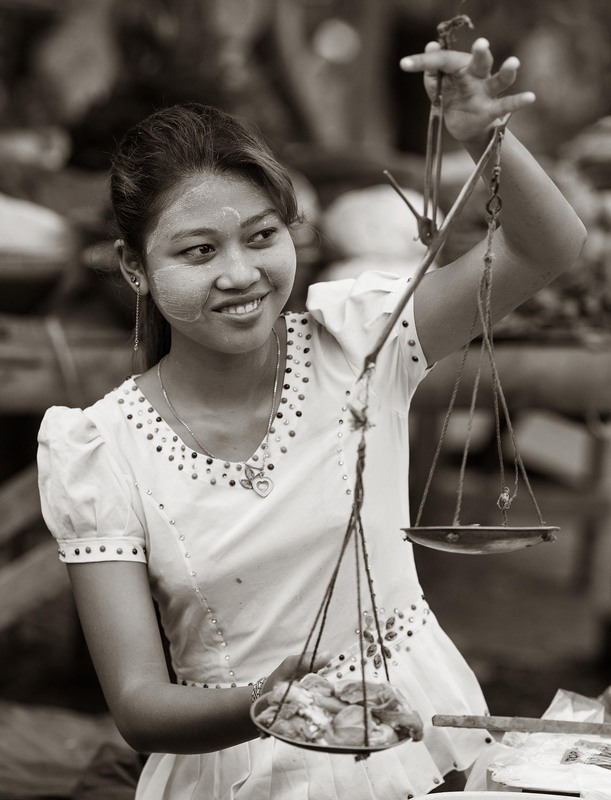 The Burmese then apply it to their face and use it as a type of cosmetic. However it is also said to have some medicinal qualities as the paste contains an anti fungal agent and also protects the skin from sunburn. 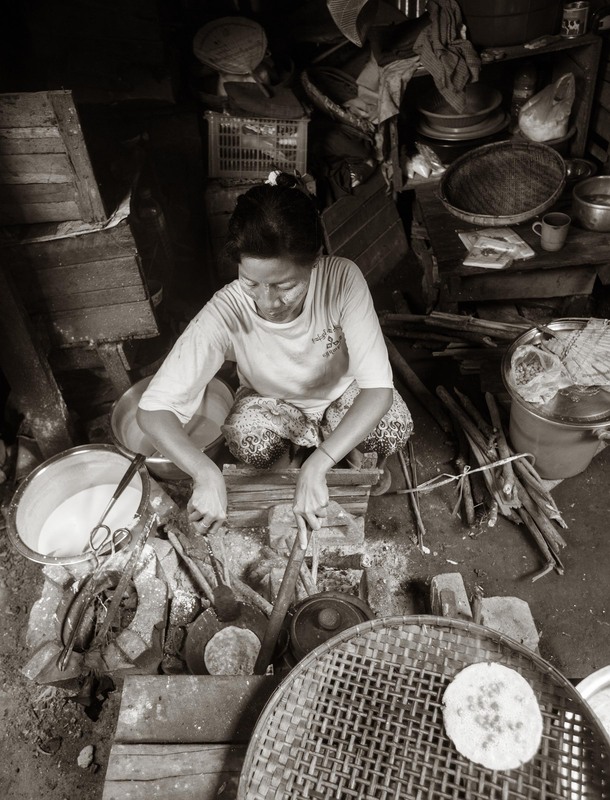 A custom for Burmese women is rub a paste made from ground bark which is known as Thanaka. This product serves as both a cosmetic and protection from the sun in addition to having a pleasing fragrance. 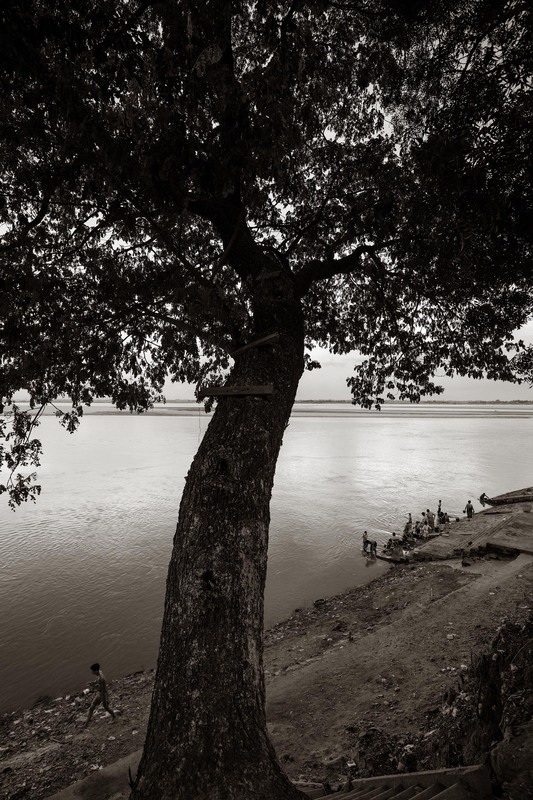 The furthest north we went on the Irrawaddy was to the city of Bhamo which is located in the Kachin state and is about 40 miles from the border with China’s Yunnan Province. Being this close to China makes it a busy city with lots of trade goods flowing through the city. 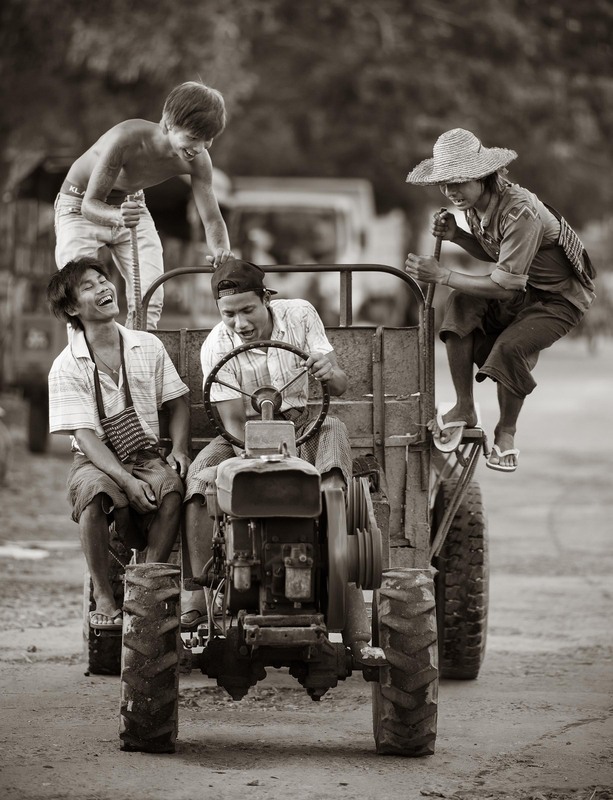 Young Burmese men enjoy a ride on the family tractor through the streets of Bhamo. 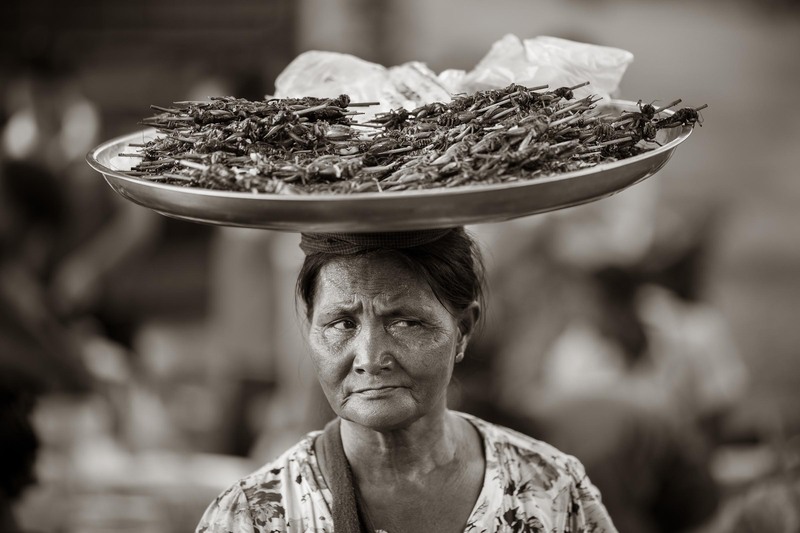 A street seller with her tray full of freshly cooked crickets looks for hungry shoppers. 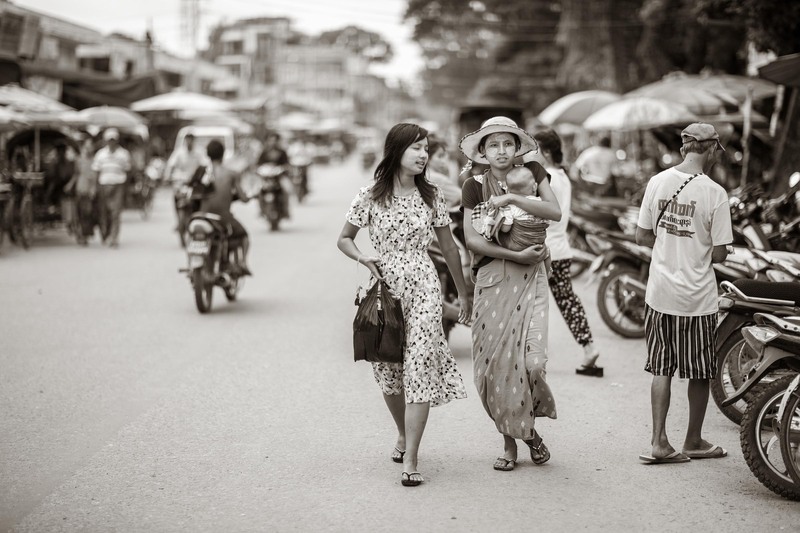 Street scene in Bhamo, one of Myanmars northern most cities and close to the border with China. At Bhamo we turned around and began to sail back down the Irrawaddy. Each village seemed to offer something different to peak our interest. 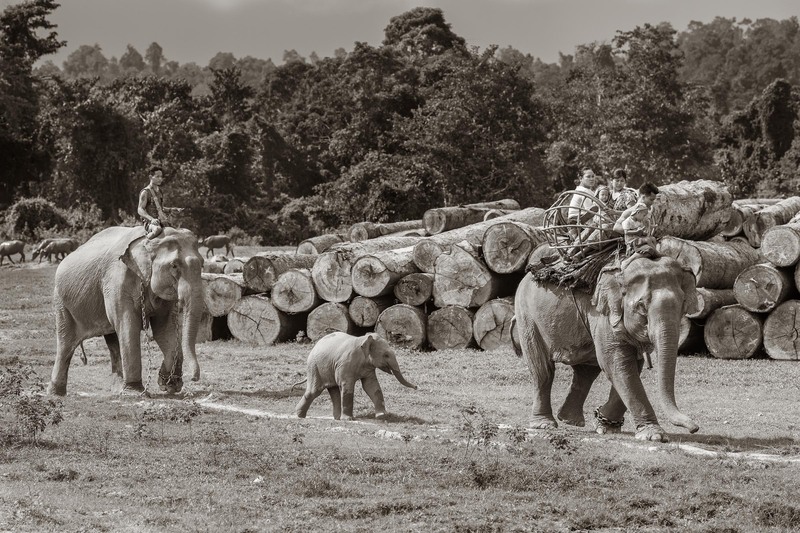 Our first stop as we headed south was to visit a village that raised and cared for elephants which were used as physical labor in the timber industry. An elephant caravan heads towards Weima Village located along the Irrawaddy River. 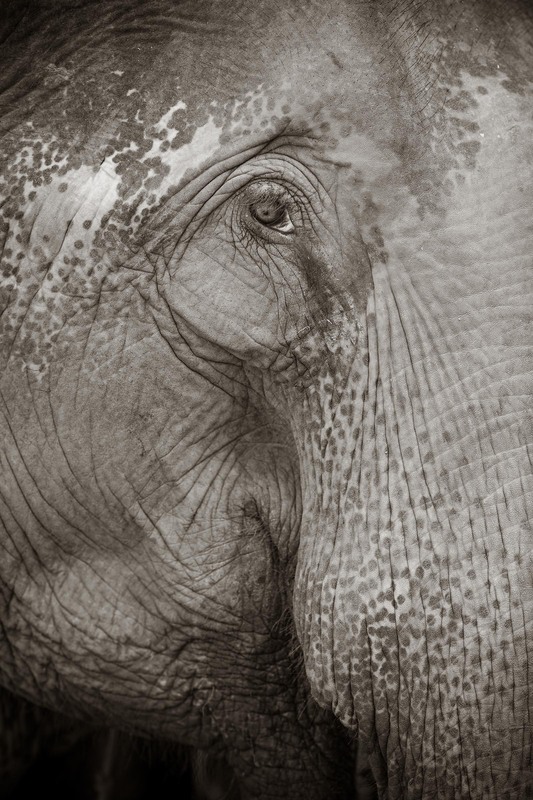 The elephants are used to do heavy labor in the timber business. 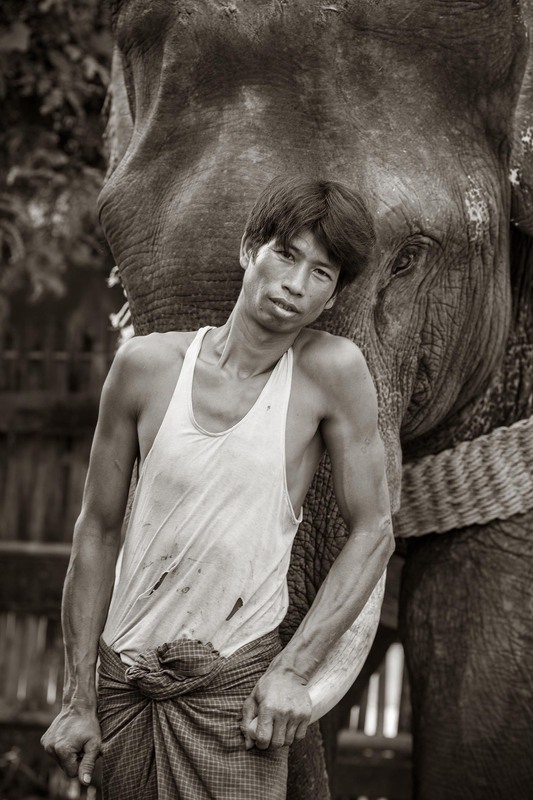 An elephant wrangler with his working elephant in the village of Weima. 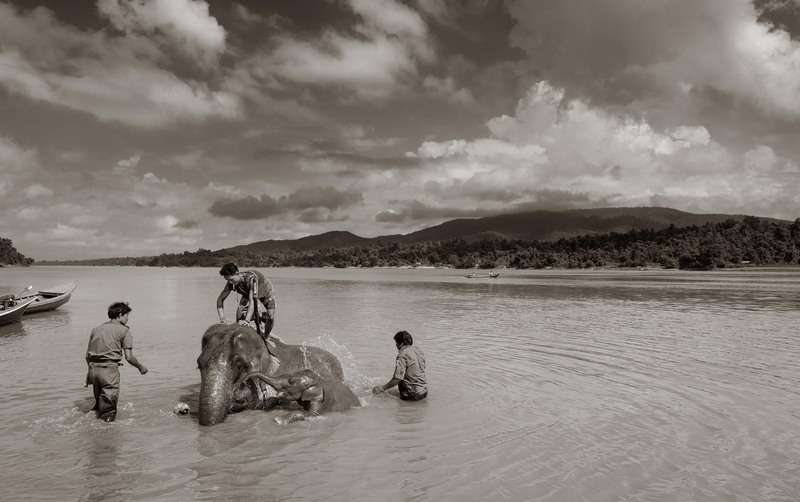 Elephant handlers bathe a mother elephant and her calf in the Irrawaddy River near the Weima Village. 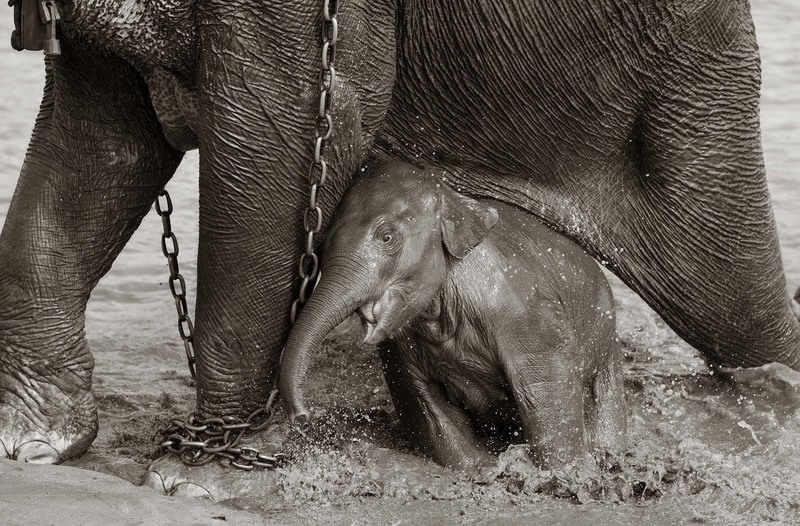 A baby elephant seeks the protection of his mother as they emerge from taking a bath in the Irrawaddy River near the village of Weima. 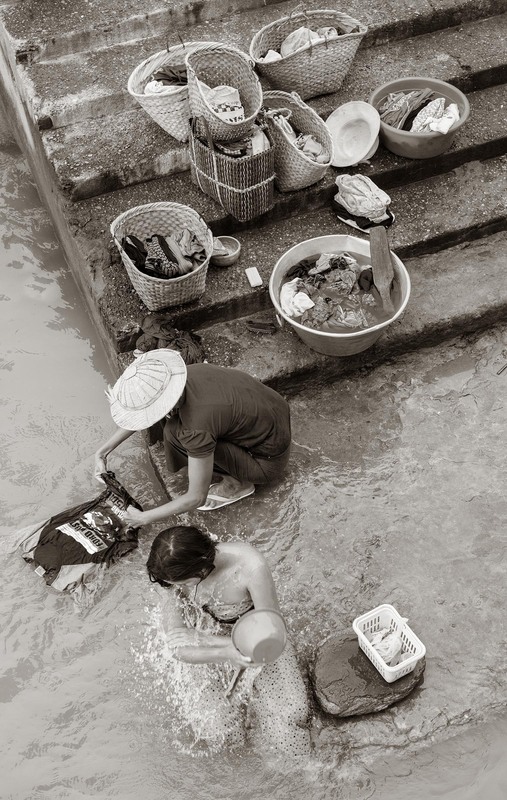 All along the Irrawaddy there seemed to be an endless amount of activity. Boats of all sizes either crossing from one side the other or moving from north to south to north carrying goods, locals commuting and even tourists. Folks along the river were always eager to share a smile or wave as we passed by. 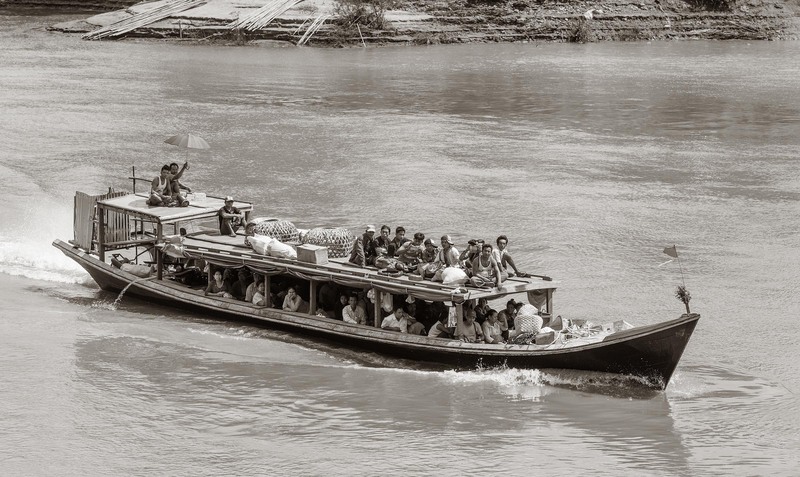 Travellers making their way down the Irrawaddy River near the northern city of Bhamo. Navigating the Irrawaddy River near the northern city of Bhamo. At the village of Ma Lai our timing was perfect to witness a Buddhist ceremony called Novitiation or Shinbyu which is a sort of right of passage event in which boys are inducted into the local temple. During the ceremony they have their heads shaved, put on Buddhist clothes and say good buy to their parents as they will stay in the temple and learn the life of a Buddhist monk. The time they stay varies for boy to boy. It could be for a few days or several weeks or perhaps for life. Apparently it depends on the boy and he’s getting along with temple life. The ceremony is a big deal for the boy and his family and even for the village. It’s massive celebration of activity. 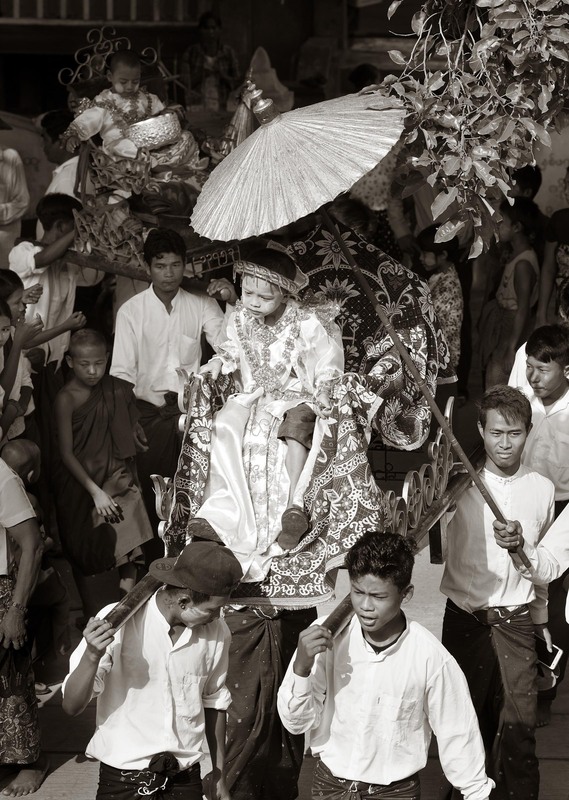 A Burmese boy is carried along the streets and into the monastery in Ma Lae village for Novitiation Ceremony where he and several other boys will be inducted into the Monastery to experience the life as a monk. The event is something that all Burmese boys must do at some point in their childhood. 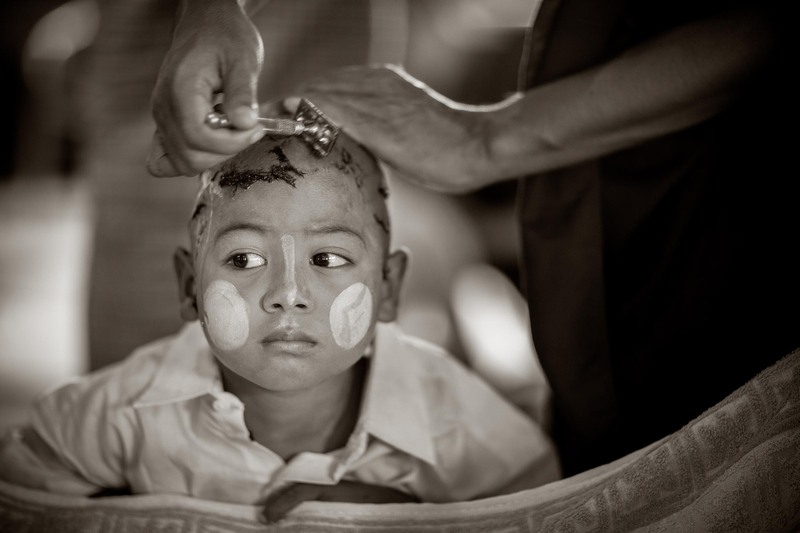 A Burmese boy has his head shaved as part of his Novitiation Ceremony at the monastery in Ma Lae village. 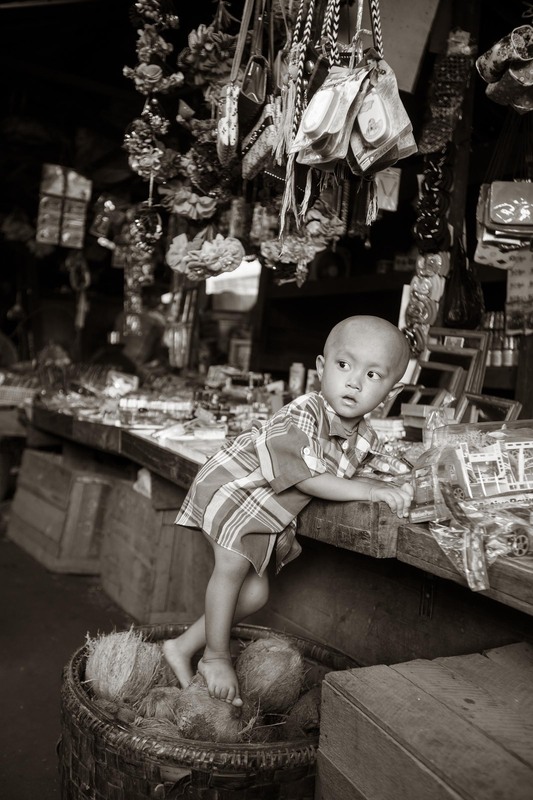 The ceremony is a kind of right of passage where all Burmese boys must experience life as a monk for a period of their childhood. 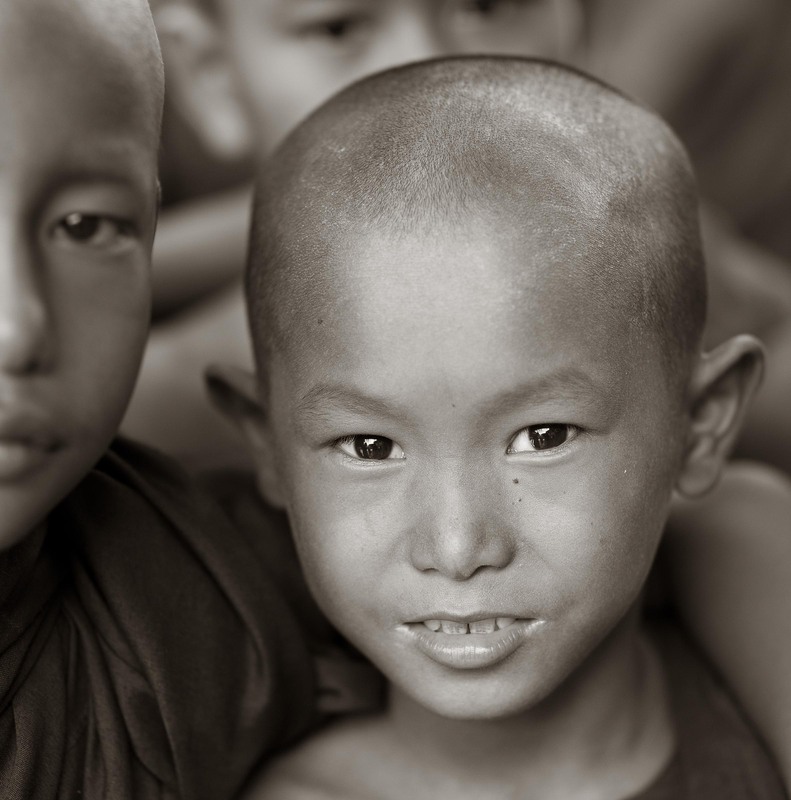 Young Buddhist monks in the village of Ma Lae. 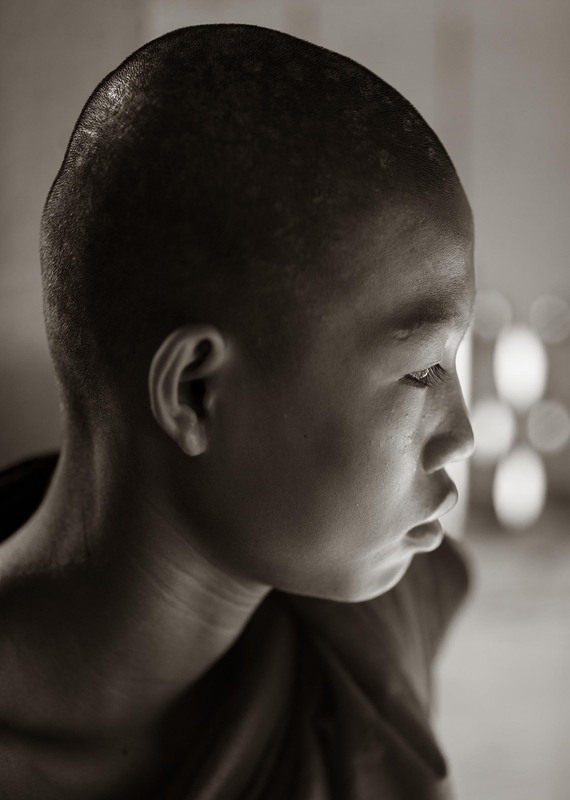 Portrait of a young Buddhist monk in the village of Ma Lae. 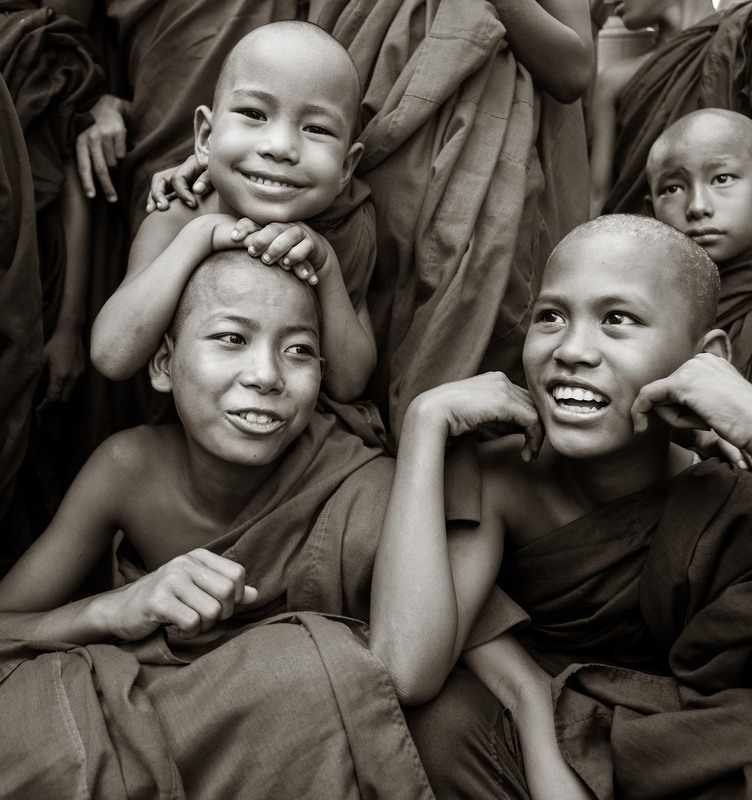 Young Buddhist monks enjoy a little free time at the end of the day in the town of Katha. 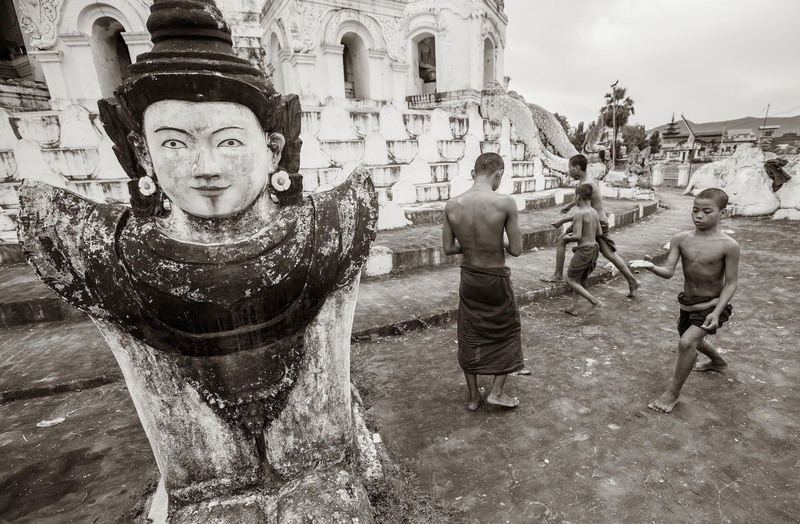 Buddhism is a huge part of nearly every Burmese person’s life. 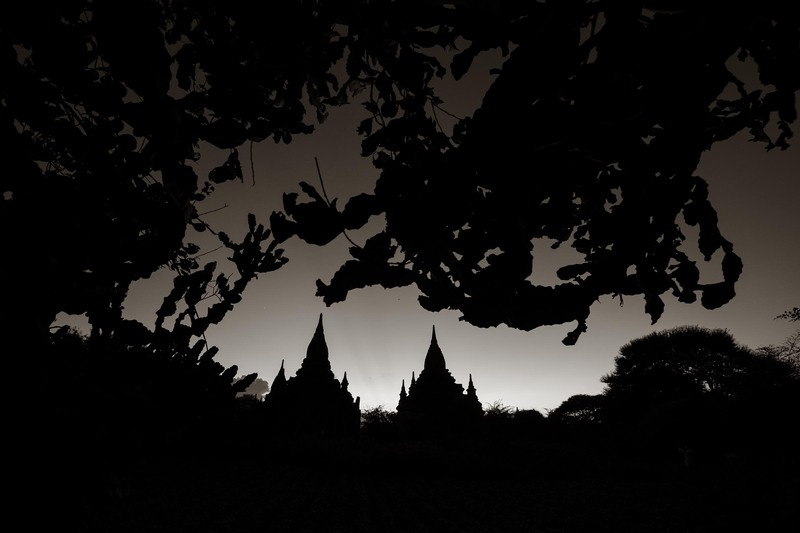 Nearly everywhere in the country you will see either temples or stupas in almost any direction you look. 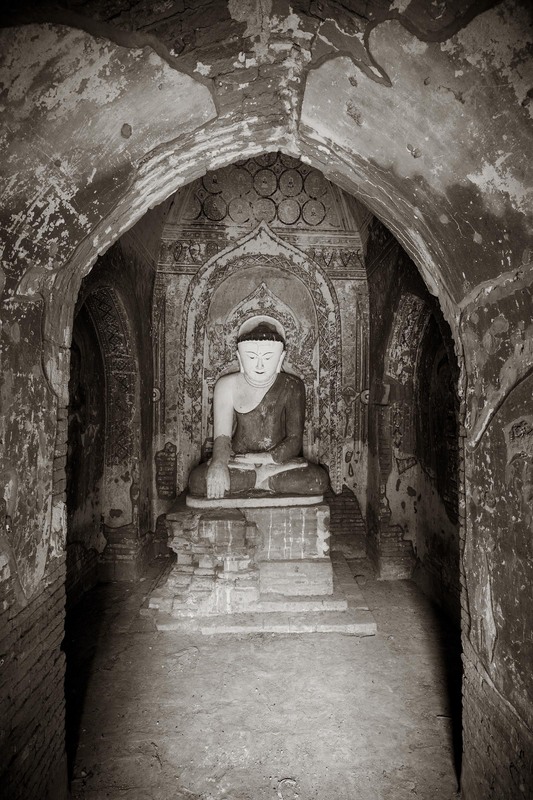 And the one place where this is most evident is in the ancient city of Bagan. 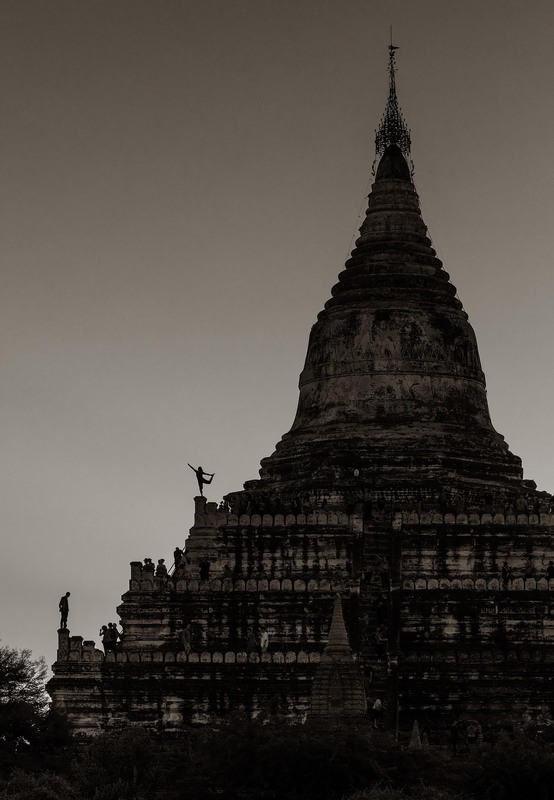 The city was once the capital of Pagan Kingdom from the 9th to 13th centuries which was the first kingdom to unify the various regions which basically created the borders of modern day Myanmar. 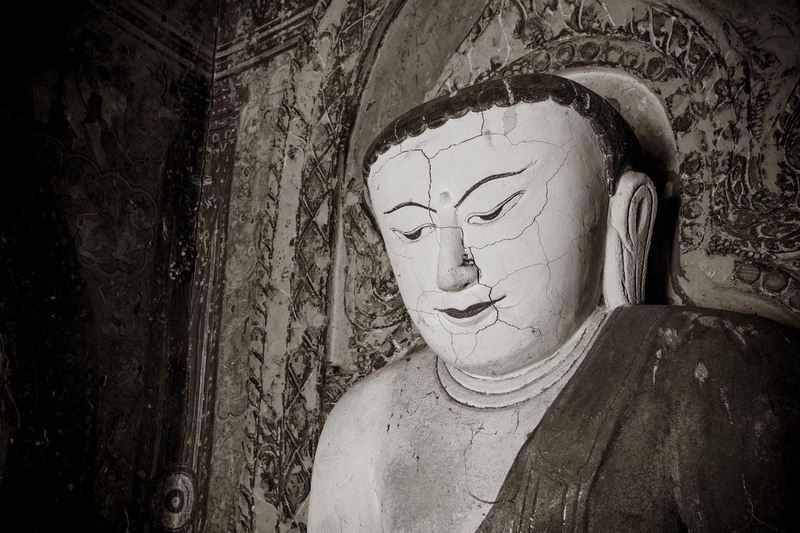 At its peak their were over 10,000 temples, stupas and monasteries of which about 2,200 still exist today. Wandering around this ancient kingdom is a fascinating exploration into the past. Though their are a lot of tourists and touts trying to sell you trinkets or services it is still a pleasant place to visit. With so many temples and pagodas still standing it is very easy to find yourself alone and feeling a bit like Indiana Jones. 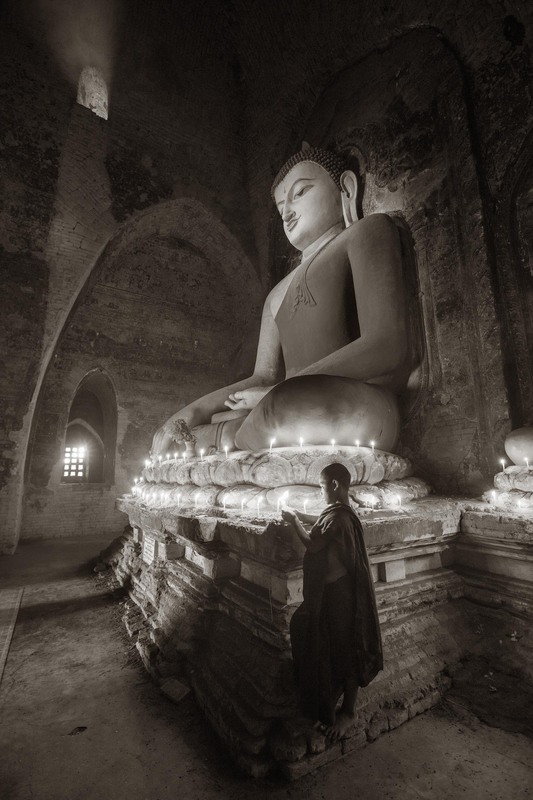 A young monk lights candles at the base of a large Buddhist statue in Bagan. 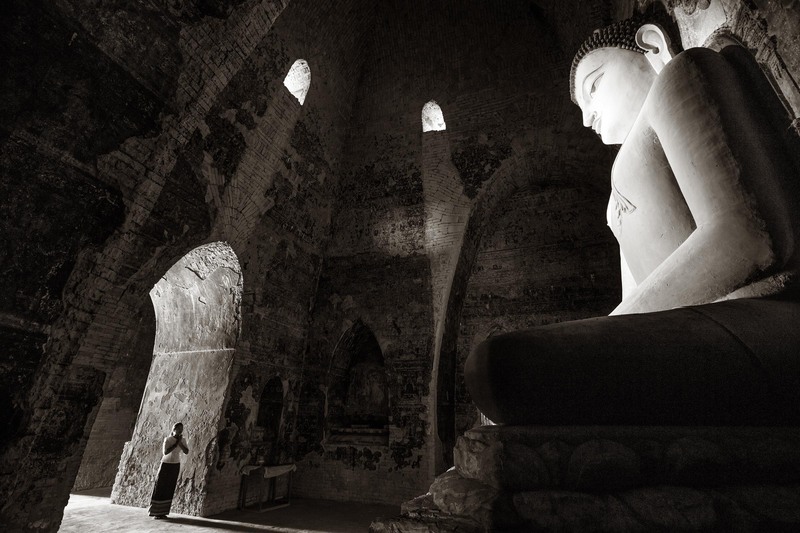 A Burmese woman pays her respects to Buddha at the entrance to one of many such temples in Bagan. As the sun sets a Bagan visitor takes the opportunity to practice a Yoga pose while standing half way up a large stupa in Bagan.